umm… hi, i just joined and well i thought it would be nice to join but… my point is i chose the power of water… and i umm… am a bit shy and i just really get nervous so… excuse me but yeah water magic is what i practice…. 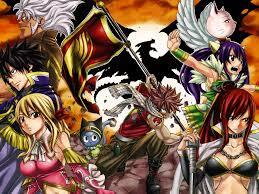 Hello everyone, I am Caesium and i'm currently applying to join the Fairy Tail community. I have been playing yugioh since I was a kid, but I did quit a few years ago. However, one of my friends brought me back into it after many long years in 2011. I then took another hiatus but am now back. I'm from Mexico and I have 16 year's. I'm a a really noob playing Yu-Gi-Oh but I like to much this game, I love the anime and play the guitar (Rock and Japanese song), soo I'm here to make new friend and have some fun. add me! (Fairy Tail)Kainin .